BRIAN KEENAN, one of the IRA’s foremost strategists over three decades of conflict passed away in the early hours of Wednesday morning, 21 May, following a long battle with cancer. On behalf of Sinn Féin Gerry Adams extended his sincerest condolences to Brian’s wife Chrissie, his sons and daughters, Bernadette, Annemarie, Chrissie, Frankie, Sean and Janette and his grandchildren; and to his brothers and sisters, and to the wider family circle. Gerry Adams said: “Although Brian had been ill for many years news of his death will come as a great shock to republicans throughout Ireland and beyond. I want to pay tribute to him and his family and to thank everyone who looked after him during his illness, particularly his friends in South Armagh and Dublin. “Brian was a formidable republican leader over 40 years of activism. He was a man of tremendous energy even in the face of a debilitating illness. He was a deeply committed socialist and trade unionist who was enormously influenced in his youth by the writings of Connolly and Mellows. “Brian Keenan’s strong endorsement of the Sinn Féin peace strategy was crucial in securing the support of the IRA leadership for the series of historic initiatives which sustained the peace process through its most difficult times. 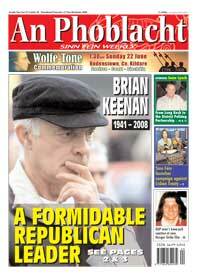 Brian Keenan’s dedication to the republican struggle was unswerving. His working class politics and his republican and socialist principles were his constant guide through four decades of unstinting effort on behalf of republicanism. The North’s First Minister, Sinn Féin MP Martin McGuinness also paid tribute to Keenan. “I am deeply saddened by the death of my friend Brian Keenan. Brian was a republican icon who along with his wife Chrissie and family made huge sacrifices through his dedication and commitment to the Republican struggle. “As a leader within Irish republicanism Brian’s contribution to the building and development of the peace process was not just immense but invaluable. His contribution continued throughout his long illness. “I was overjoyed that Brian was able to be with us in Stormont on May 8th last year to see the restoration of the power sharing and all-Ireland institutions. This would not have happened without his hugely important contribution. Brian’s remains will leave Patrick Street, Cullyhanna in South Armagh at 12 noon today (Thursday, 22 May) for a ceremony at the Michael McVerry memorial in Cullyhanna. The remains will arrive at the family home at New Barnsely in Belfast at 4pm. The funeral will take place this Saturday, 24 May in Belfast. BRIAN KEENAN, one of the IRA’s foremost strategists in ‘The Long War’ over three decades, was once described by Tony Blair’s Chief of Staff at 10 Downing Street, Jonathan Powell, as “the single biggest threat to the British state”. Brian’s pivotal role in the political and the armed struggle was also acknowledged by his comrades earlier this year when he was among the honourees at the Le Chéile celebration for those who have given outstanding service to the republican cause and the fight for Irish freedom. Shortly after joining the IRA, in 1968, Brian went on the run and spent the next 25 years living apart from his wife, Chrissie, his children and his grandchildren. He served 16 years in various jails across England in Special Secure Units (SSUs). His story began on Belfast’s New Lodge Road in 1941. When the Second World War was over, Brian’s father returned to Belfast and the Keenan family set up home on Belfast’s West Circular Road. As he was growing up he experienced at first-hand the sectarianism that was prevalent for Belfast Catholics. It was this sectarianism that led a loyalist mob to the door of his family home to drive his mother and father out of their house at the onset of ‘The Troubles’ in 1969. It was also the first time Brian Keenan carried a gun. With other armed IRA Volunteers, he arrived to protect his family and bring them to safety. Sectarianism was not confined to the streets of Belfast. It was also in the workplace where Brian, in his first-ever job, personally experienced “second-class citizenship”. In 1958, Brian moved to England to escape the sectarian harassment he was experiencing in work. He continued his apprenticeship in Luton in a firm which made guided missiles and it was there he met trade unionists involved in the Campaign for Nuclear Disarmament (CND). He attended his first union convention as a delegate when he was just 17. It was from this point on that he analysed politics through a “class prism”. On his return to Belfast the blatant discrimination against Catholics and nationalists in the North propelled him into becoming active in the Civil Rights movement. In 1968 he joined the Irish Republican Army. During the years of conflict he became one of the IRA’s foremost strategists and a thorn in the side of British imperialism. Intensely proud of IRA Volunteers’ heroism and ingenuity and the struggle waged by the ‘People’s Army’ against the British Army — possibly the most professional but certainly one of the best armed, equipped and resourced military forces in the world — Brian Keenan never let this blur his vision of the needs of the struggle and the challenges it faces. It was leaders like Brian Keenan who steered the IRA through events such as internment, the Bloody Sunday massacre by the Parachute Regiment, the unionist work stoppages, sectarian conflict, and the unrelenting war waged by the British state and its allies and agents against the nationalist people in the Six Counties. England was a theatre of war that became central to IRA strategy to move the political situation to a resolution. It is an area that has become associated by British commentators with Brian Keenan perhaps more than any other contemporary IRA leader. “The IRA leadership knew we could not defeat the British Army militarily but we could bring them to a point where they knew they could not defeat the IRA,” Brian told An Phoblacht earlier this year. “We aimed to exhaust their patience through war in the Six Counties and subsequently the campaign in England. You have to be able to bring the struggle to their front door.” The England campaign was a necessary appendage to the armed struggle in the Six Counties. 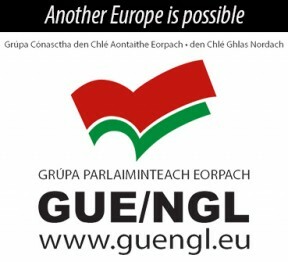 It sent a powerful message to the British Establishment, political and military. Brian was one of a new breed of leaders who helped re-organise the IRA — derided after unionist sectarian pogroms led by the RUC in 1969 by the wall slogan ‘IRA = I Ran Away’ — into an effective fighting force that won begrudging admiration from its enemies. Although he recognised the challenges political progress still faces, he argued that the IRA was morally obliged to look at alternative options to continuing the war, especially if there was a viable alternative. And as a committed revolutionary, dedicated to social as well as political change, Brian Keenan ended his interview with Jim Gibney by outlining where saw the current situation.